For by grace are ye saved through faith; and that not of yourselves: it is the gift of God: 2:9 Not of works, lest any man should boast. 2:10 For we are his workmanship, created in Christ Jesus unto good works, which God hath before ordained that we should walk in them. Realize at the outset of your walk with the LORD, that both the salvation and the everlasting life that comes from Him, is His gift to you. In other words, while it is certainly true that "Ye must be born-again" as the Lord Jesus taught us in John 3:3, that regenerated, new life is the creation of GOD. It is by His love and mercy alone that you are (or shall be) saved. This is clearly the message of the above scriptures. You cannot work your way into Heaven. This matter of salvation is a matter of love, not a matter of works. It is not us reaching up to GOD, but GOD reaching down to us in His MESSIAH, Yeshua of Nazareth. Praise His name for this gift, and receive it! 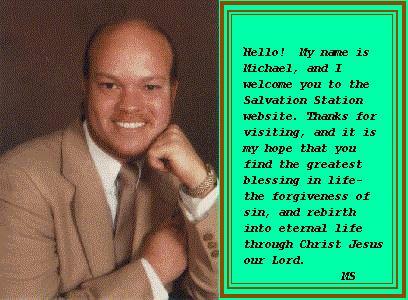 Go through the steps to salvation listed later on the website to learn more about this gift. There will be plenty of work to do, and a good fight to fight [1 Tim 6:12], but you must realize that it is the Spirit of GOD who is doing the work in you. This point is made specifically clear in the above scripture Ephesians 2:10, and throughout that chapter. The work is Christ's. What is your responsibility? It is to yield to His will.